Ah, the sports comedy. It's a tried and true formula that - when executed well - is one of the most reliable things going. Witha few notable recent exceptions - Canada's Goon springs to mind - they've also been an overwhelmingly American phenomenon but Australian director Mark Grentell is looking to put a very local - and also very not local spin on the approach with The Merger. The township of Bodgy Creek has seen better days: the population is dwindling, jobs are scarce & the litter has built up around the fading Tidy Town sign. The next victim of the town's decline is the cash strapped Aussie Rules footy club. Barely able to field a team, the club is reeling from news that their clubrooms have been condemned due to asbestos contamination. A left field solution to their woes comes in the form of former football star Troy Carrington [Damian Callinan] Having fallen out with the community over leading protests that led to the closure of the local timber mill, Troy is living a hermit like existence on the towns fringe. However, he is coaxed into coaching after striking up an unlikely friendship with young Neil [Rafferty Grierson] who is struggling with the recent loss of his father. Teaming up with Neil's mum Angie [Kate Mulvany], who is running a nearby refugee support centre, they conspire to recruit refugees to save the team. However, the plan is not well received by Neil's Grandad & Club President Bull Barlow [John Howard], who leads a concerted protest to undermine the refugee's settlement. 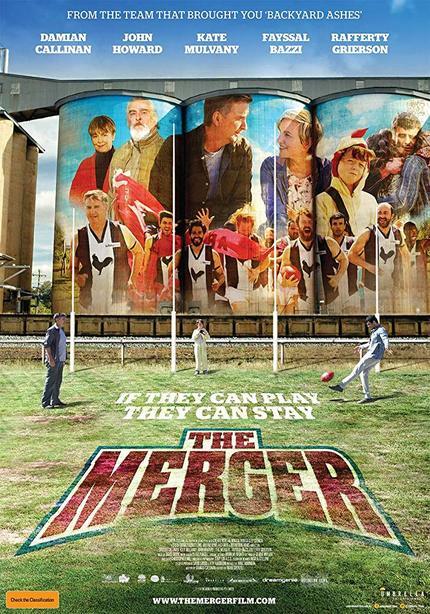 Yep, these is an Aussie Rules Football refugee comedy. And the trailer looks quite good. Take a peek below.